Coatlicue - Goddess of fertility, life, death and rebirth. - Aztec Goddess. Coatlicue the one with the skirt of serpents also known as Teteoinan was the Goddess who gave birth to the moon stars and Huitzilopochtli. Home ¦ Divinity of the Day ¦ Aztec Gods and Goddesses ¦ Coatlicue - Goddess of fertility, life, death and rebirth. Coatlicue - Goddess of fertility, life, death and rebirth. 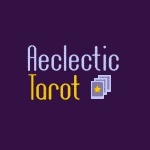 Coatlicue ("the one with the skirt of serpents"), also known as Teteoinan, was the Goddess who gave birth to the moon, stars and Huitzilopochtli. She is represented as a woman wearing a skirt of snakes and a necklace made of human hearts, hands, and skulls. According to myths, she was magically made pregnant by a ball of feathers and gave birth to the gods Quetzalcoatl and Xolotl. 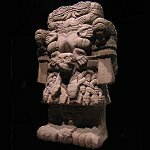 Her daughter, Coyolxauhqui, goaded Coatlicue's four hundred children into attacking and decapitating their mother. At the moment of her death, Huitzilopochtli, the god of the sun and war emerged from her womb fully grown. He killed many of his brothers and sisters and threw the head of Coyolxauhqui into the sky where it became the moon.